Travelling with a dog is one of the best things that you can do, when your travel schedule allows for it. 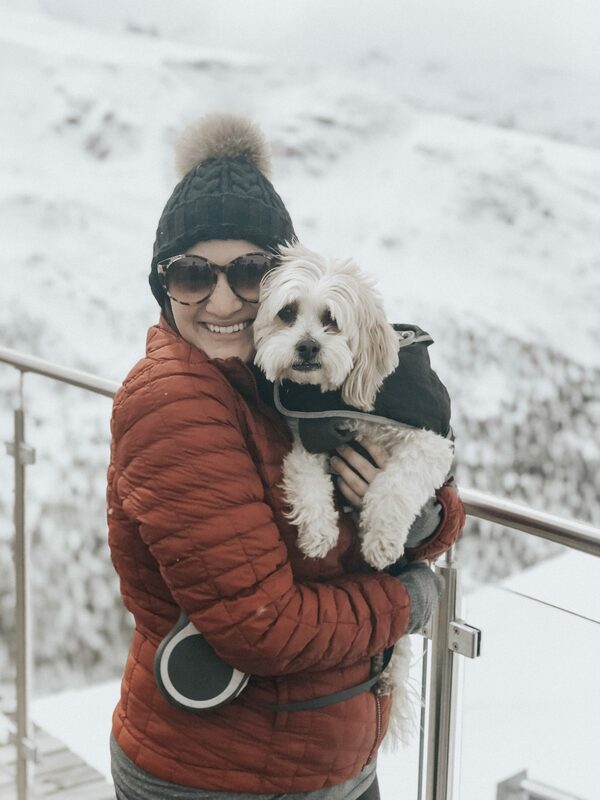 Not only will you be happier on your travels and form incredible memories with your pet, but it can also save you a ton of money and hassle by eliminating the need to find dog care. 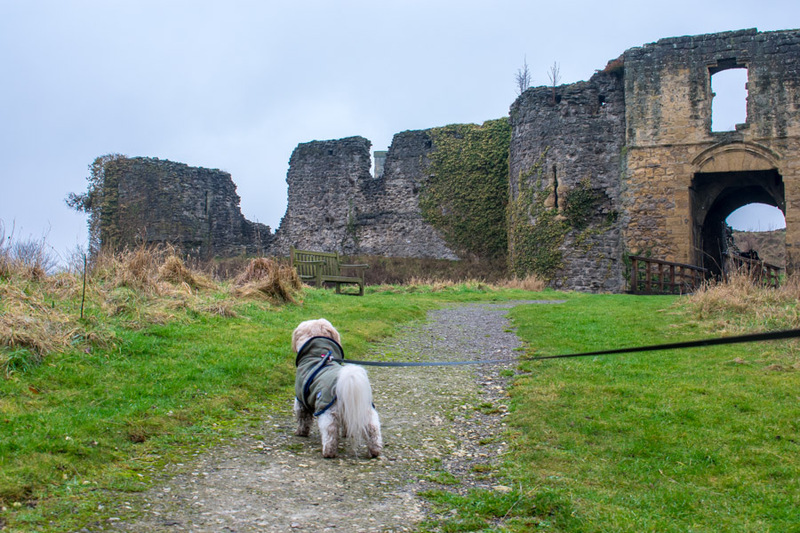 Our journeys around the UK with Giorgio are responsible for some of our fondest travel memories, and we actually find ourselves planning dog-friendly travel more and more because we have such a great time exploring with him. As glorious as we make dog-friendly travel seem, travelling with a dog is not as easy as get up and go. 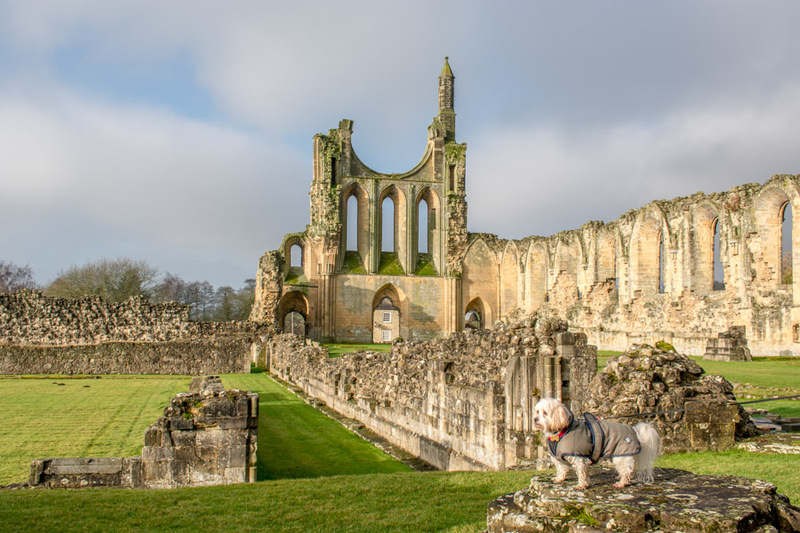 There is a lot of preparation that goes into travelling with a dog, such as finding dog-friendly accommodation and identifying dog-friendly places that you can stop. Additionally, it’s not so easy to pack up everything dog related that you own and throw it in the car, so having travel-specific pet accessories can make your dog-friendly travel much more stress-free. For the longest time, we never even thought of using a car seatbelt for dogs. However, one time when Sean’s dad was taking Giorgio on a car journey, he requested that we get him one. And it’s now one of our favorite accessories for travelling with a dog! Not only do we feel much more confident knowing that Giorgio is safe in the back seat, but being buckled in seems to help him relax as well. We usually buckle him into the middle seat and place his bed there so he can lay down and relax while we’re driving. There are a variety of doggy seatbelts available. We have one that very simply clicks into the seatbelt and attaches to his harness, but there are options that come with a built in harness or collar, as well. Planning a road trip with your dog? 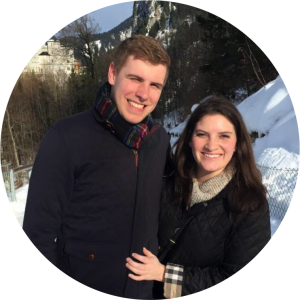 Check out our road trip tips! Being alone in an unfamiliar place can be very stressful for dogs, so we always pack a collapsible dog crate in order to give Giorgio a safe place. While we’d love to take him absolutely everywhere with us, sometimes we have to leave him in our hotel in order to go to dinner or see some sites. When this happens, we pop up the collapsible dog crate, throw his bed and bone in there, and he has the same setup he has at home. Collapsible dog crates are the perfect dog crates for travelling because they are easy to pack, but offer full crate functionality when expanded. We use a wire one that packs down flat, but there are also softer collapsible crates available. Due to a mix of excitement and nervousness, Giorgio pants a lot when he’s in the car. This leaves an extremely thirsty dog, so we always encourage him to drink water when we get to rest stops. Although it’s easy enough to put down a bowl and pour some water from our personal water bottles, dog friendly water bottles make things a lot easier. These water bottles are shaped so dogs can essentially drink straight from the bottle, leaving very little mess when on the go. 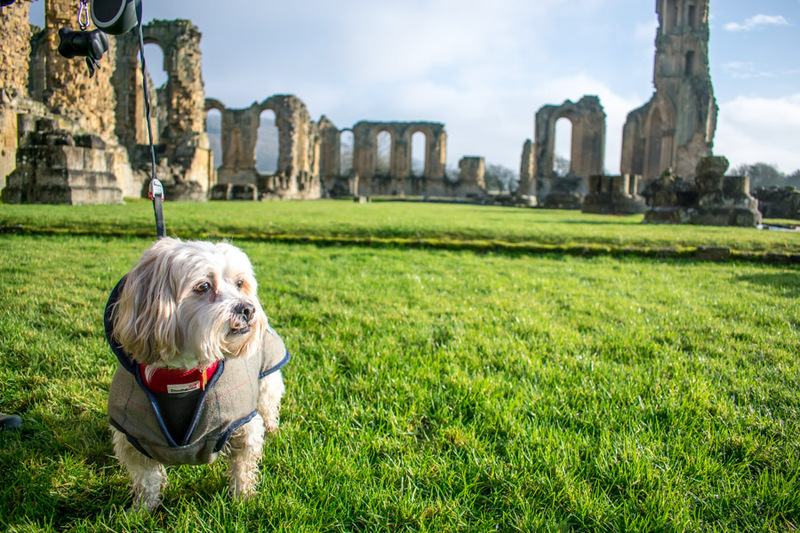 They’re a great accessory for travelling with a dog, but are also great for long walks in the summer, or days where you are out and about with your dog for an extended period of time. 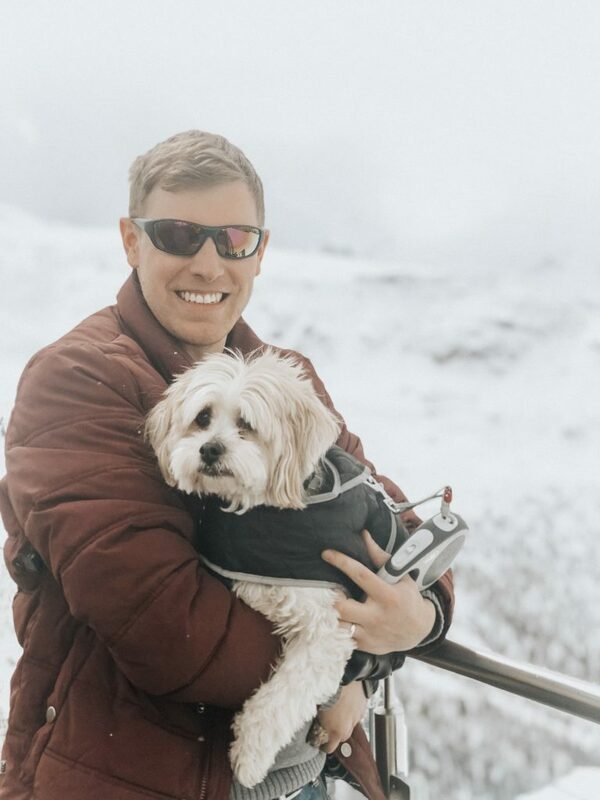 Yes, dog jackets make for incredible Instagram photos. But, even better, they also keep your dog warm and dry. It’s so nice to be able to take Giorgio out in the rain and only need to worry about drying his paws when we get back, not his entire body. We travel with two different jackets, depending on the weather and time of year; one is a lighter, ‘rain coat’ as we like to call it, and the other is a heavier coat that allows for long walks on even the chilliest days. p.s. If you prefer to splurge on your pooch, we are planning on trying out this Dharf dog jacket this year. It’s weather proof and even has a built-in harness, so there’s one less thing you need to carry! For cold and wet conditions, dog booties keep paws warm and dry. We have yet to try out dog booties while travelling with a dog, but we plan on purchasing some this month to take out to Switzerland this month. Some booties are more like socks and simply keep paws dry in rainy weather, while others are a bit thicker. Everything we have read about dog booties suggests that it takes awhile for dogs to get used to them. 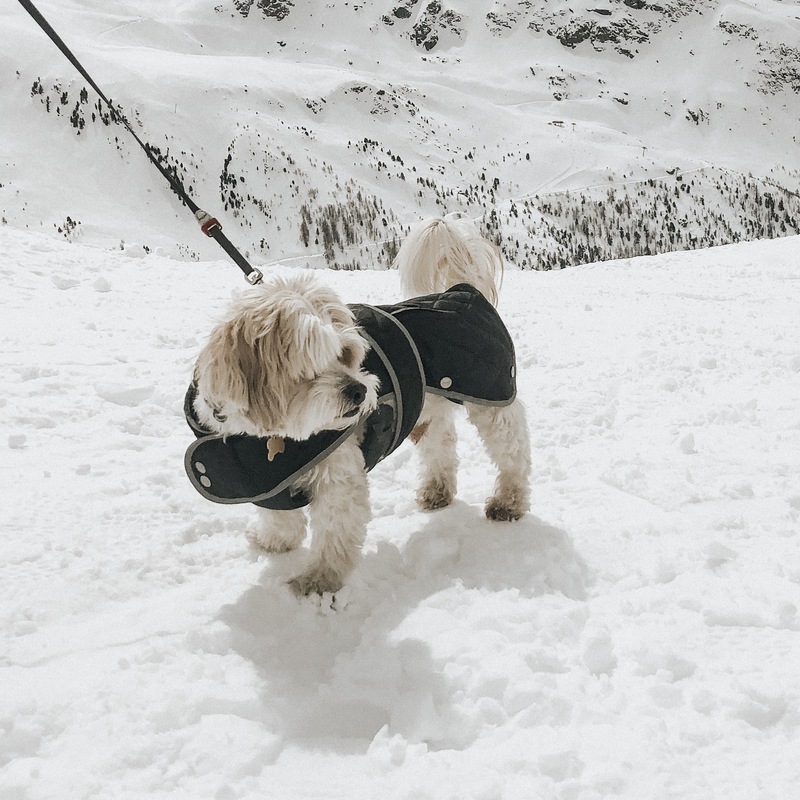 So, if you are planning on taking dog booties on your dog-friendly adventure, we recommend buying them in advance and trying them out around the house and on shorter walks first. Then, if you get hit with rain or snow on your trip, your doggy will be ready to put on his/her boots! We love collaps-a-bowls so much that we actually use them throughout our house in addition to using them while travelling with Giorgio! These bowls flatten completely, making them perfect for storage. You can just throw them in your bag, pop them up when you need them, then give them a quick wipe down before putting them back in your bag. When we don’t have a dog friendly water bottle on us, we use collap-a-bowls at rest stops and sometimes even set one up in the pub. Collaps-a-bowls come in all shapes and sizes. Some even have lids, making it incredible simple to prepare and store a meal before hitting the road. Also, if you want to be total #dogmomgoals, this dog travel tote comes with plenty of storage space AND a feeding area (bowls included!). Yes, we are planning on buying one. A picnic blanket is one of our most essential items to pack when travelling with a dog. On our first trip with Giorgio, we decided to throw a picnic blanket in at the last minute to cover the seats and it has been a go to since then. Not only does the picnic blanket serve as a seat cover in the car, but it also serves as a picnic blanket when you decide to stop. We are always taking the blanket out and throwing it back in during our dog-friendly travels. The best part? It captures all of the sand and the mud so your car seats don’t have to! Towels are key for washing and drying your travelling pup, but also for serving as a place to rest while on the go. We generally travel with two towels for our dog. One towel stays in the car while we’re out and about for wiping paws and drying the wet dog after sudden downpour. A second comes with us to the hotel to serve as a mud guard and a post-bath towel. 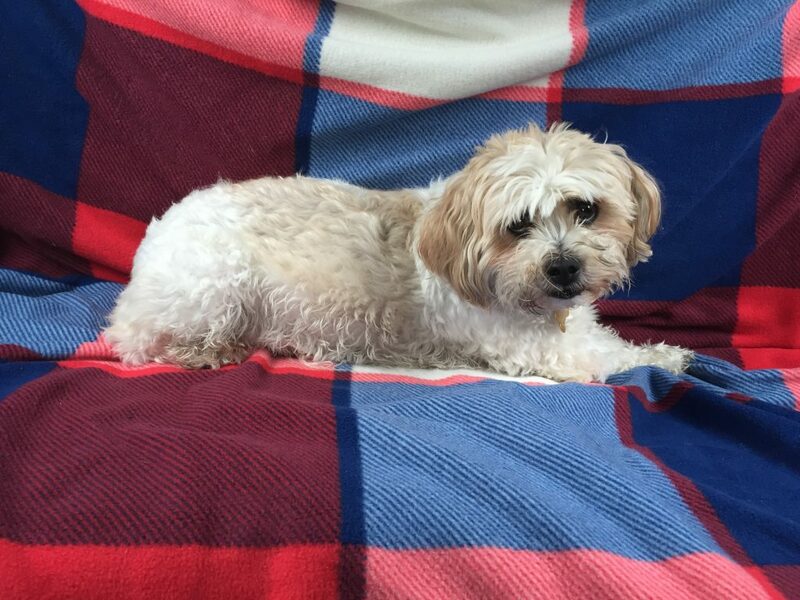 We recently invested in this microfibre dog towel which does a great job of drying Giorgio when he’s extremely wet. It’s super absorbent and is actually meant to always stay damp; we haven’t figured out the logistics of it, but it works! Any old towel will work for travelling with your dog, but there are some pretty cool products out there if you want a dog-specific towel. We just can’t get enough of the doggy robes. Our rule of thumb for how much food to pack when travelling with a dog is to overpack. If you accidentally serve too much one night, or end up staying an extra night, the last thing you want is to scramble to put together a meal. Switching dog food can often result in a runny tummy for your dog, and that’s the last thing you want when you’re going to be stuck travelling with them for a couple of hours on your way home! We always bring an extra can and pack all of Giorgio’s dry food so we know we’ll have enough. Before you go, research if there will be any dog stores near where you are staying (and if they carry the food you need). 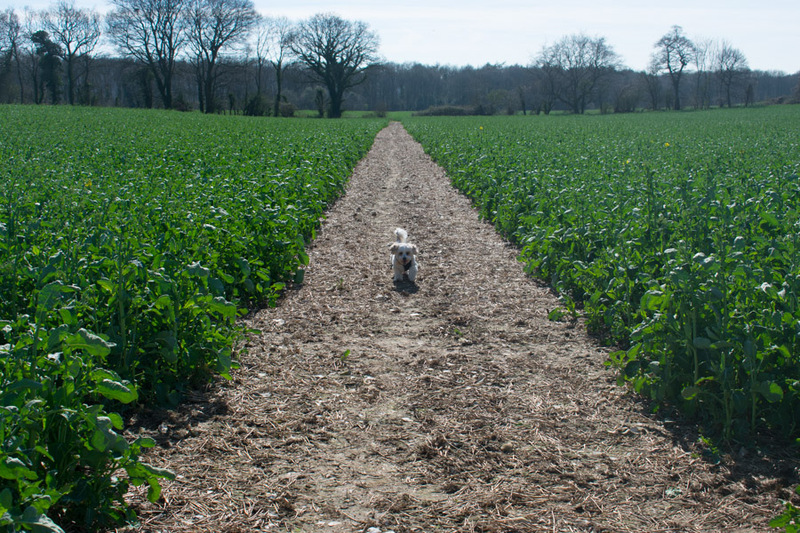 Giorgio eats Lily’s Kitchen – an organic dog food – so we know that we can only find it at specialist stores. This is great knowledge to have in emergency situations! Muddy paws are not a good thing when it comes to dog-friendly hotel rooms. Especially if your dog tends to disobey the rules and jumps on the bed as soon as you arrive! Luckily, many hotels these days offer dog washing facilities, but in order to be prepared, it’s best to bring your own dog shampoo. What road trip is complete without a stop at the gas station for snacks and sweets? The same goes for dogs! Like small children, you need to keep dogs entertained on long journeys in order to keep them from whining. Make sure you bring along all of your dogs favorite toys & treats so they feel right at home, even when they’re very far away from it! This is a cheesy one, but we couldn’t resist including it! After all, when travelling with a dog, you want to capture those incredibly cute moments as your dog sees the world. Photographing a dog can be tricky, but we love the photos of Giorgio that we end up with. All of the photos in this post were taken with either our Nikon D3400 or our iPhones (6, 8+). Dogs are like babies in the sense that they pretty much require more than humans when travelling. And that accessories for travelling with a dog make for much cuter photos than human travel accessories. But, in all seriousness, you do need to think in advance about what to pack when travelling with a dog. Because, well, they can’t pack for themselves! 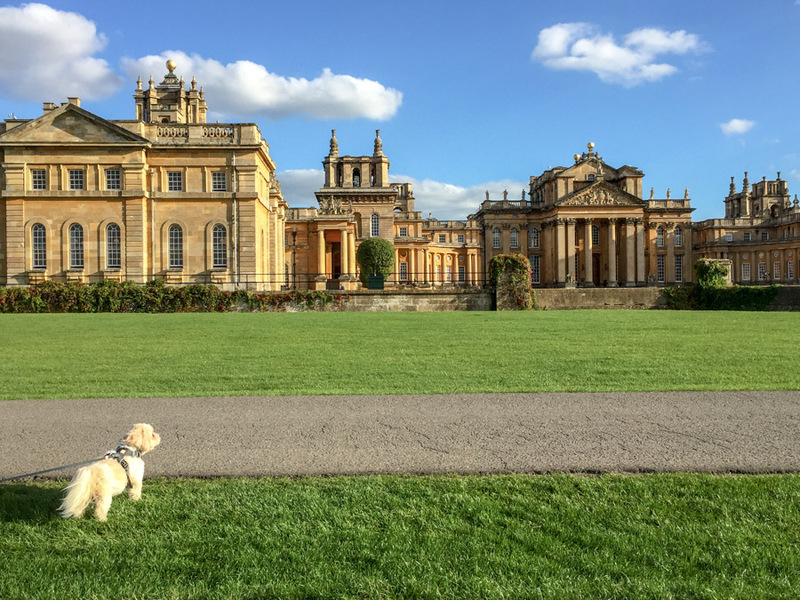 If you love dog-friendly travel, be sure to follow along with our adventures with Giorgio as we travel around the UK and Europe. Looking for more tips for travelling with a dog? Leave your questions in the comments and we will put together a dog-friendly travel Q&A! Great post! We’ve recently welcomed a Rough Collie puppy home called Kai and so we’ll be exploring more of the UK too (once he’s older, of course). That doggie water bottle sounds like a great idea – is there a particular one you use that you could send me a link to? I think we could definitely do with one of those, but couldn’t see a link in that bit of your article, so just thought I’d ask! Congratulations! Traveling with a dog is SO fun and I’m sure you’ll have some incredible adventures. We currently use the Snack Duo one (fourth one in the post) but actually just purchased the H204K9 (first one) and are so excited to try it on our next trip this week! After researching the options it seemed like the best one for providing an easy drinking mechanism for the dog while keeping everything dry and clean as well! This is the cutest dog!! You treat Giorgio so well and bring him to so many places, I’d love to be your dog, too! Unfortunately, my dog has never been fond of moving vehicles (we even tried desensitization while she was a puppy but she spits out any treat once the car starts moving and just never grew to like it), or we’d always be bringing her along on road trips!